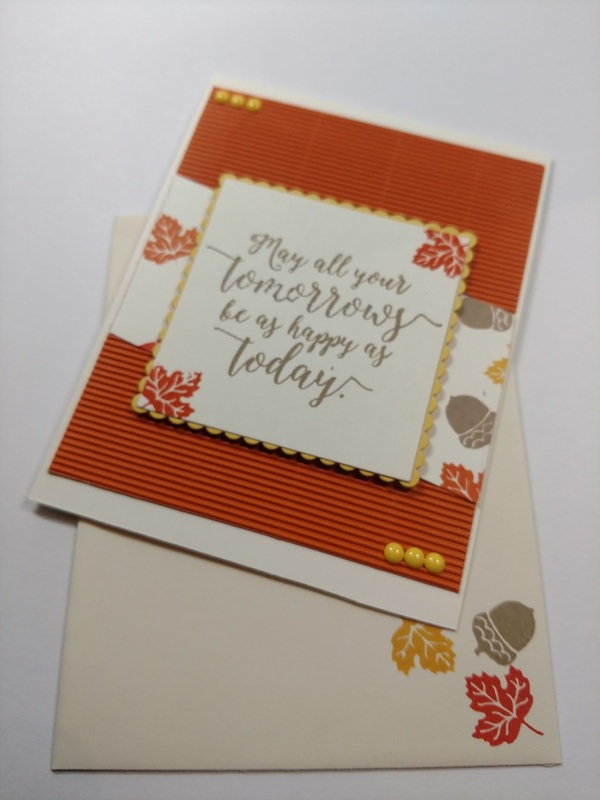 Paper Pumpkin - September 2017 "Layering Leaves"
Paper Pumpkin - September 2017 "Layering Leaves" Images©Stampin' Up! Some people live for autumn—the hay rides, the apple picking, the ripe fields and harvest moons—not to mention the pretty pumpkins on every windowsill and doorstep. To celebrate this splendid season, why not add to the beauty by making our stunning fall packages to give to a teacher, neighbor, coworker—maybe filled with spiced cider mix, roasted almonds, or pumpkin truffles? Just about anyone would love getting a package or card with layers of leaves and opulent hints of gold—handmade with love! And while these projects look super-fancy, don’t worry—they’re very easy to assemble. 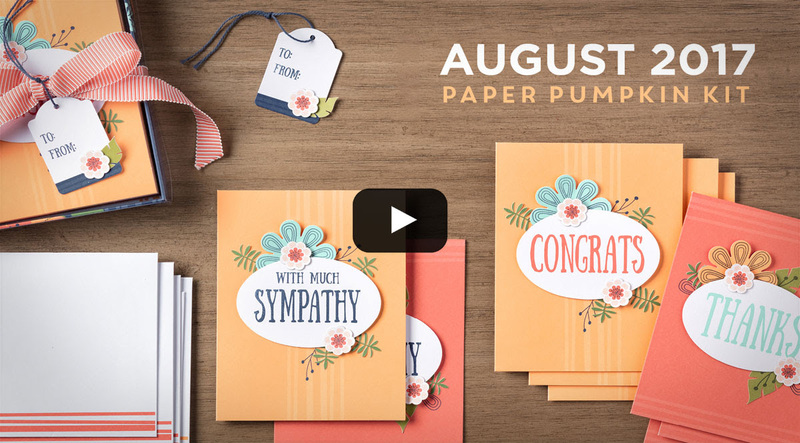 Watch the video for details, then don’t wait—start stamping! I really love how the kit comes with step by step instructions to create the kit on your own. made a super cute alternative. There's still time to get the refills for this kit. Become a subscriber by October 10th and you will gain access to all past kits and refills while supplies last. May All Your Tomorrows be as Happy as Today! Here's my alternative using supplies from May & September 2016 kit and September 2015 kit. I really love this Fall theme card. 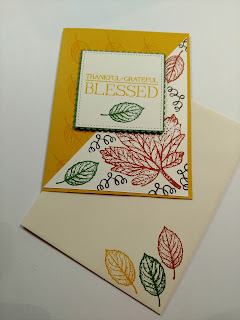 In this project I'm adding the old Paper Pumpkin stamp sets with a new stamp set. Card base: Very Vanilla 8.5 " x 5.5", score@4.25"
Daffodil Delight Cardstock 4" x 6"
Create custom designer series paper using the paper pumpkin stamp sets on one piece of very vanilla cardstock. On the other piece stamp the sentiment. Using the 3" scalloped square die and cut the daffodil delight cardstock. Stamp sentiment on the other piece of very vanilla cardstock and die cut with the 2 7/8" die. 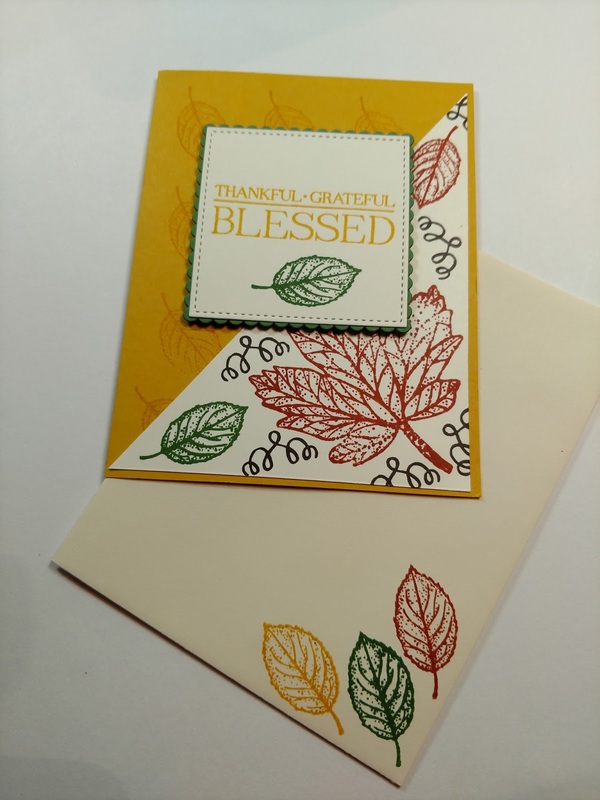 To give sentiment layer an extra pop stamp leaf image as illustrated. Use the fast fuse adhesive to attach the corrugated paper to the card base. Use adhesive to layer designer series paper according to the picture. 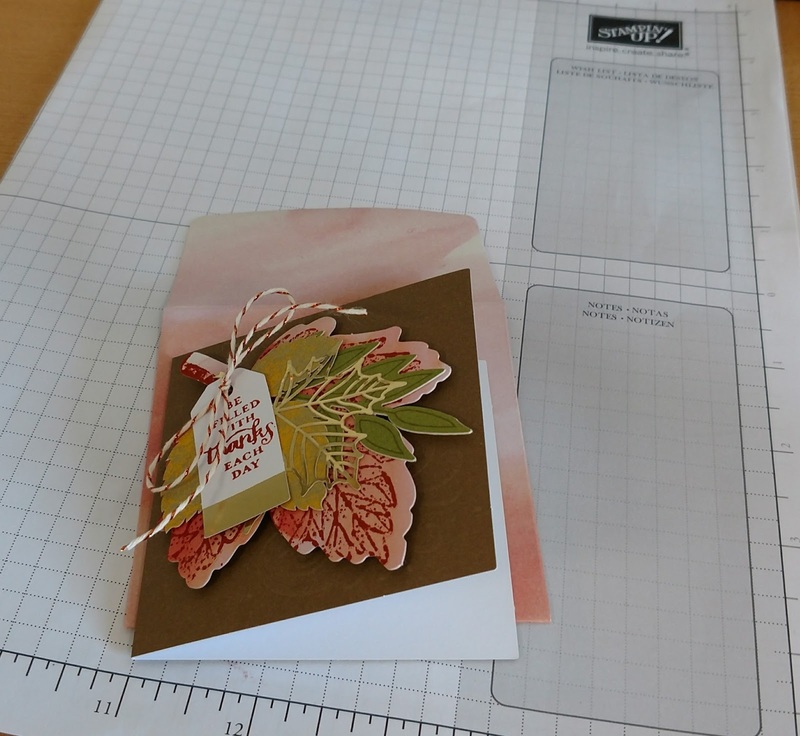 Use adhesive to attach sentiment square to scalloped die cut square. Using dimensionals to attach the sentiment layer to card base. Add six enamels shapes as shown in the picture above. This will give the card that extra bling! Woohoo another cute project completed. To share in the joy of creating paper treasures please join my team! Every creation is a priceless treasure! 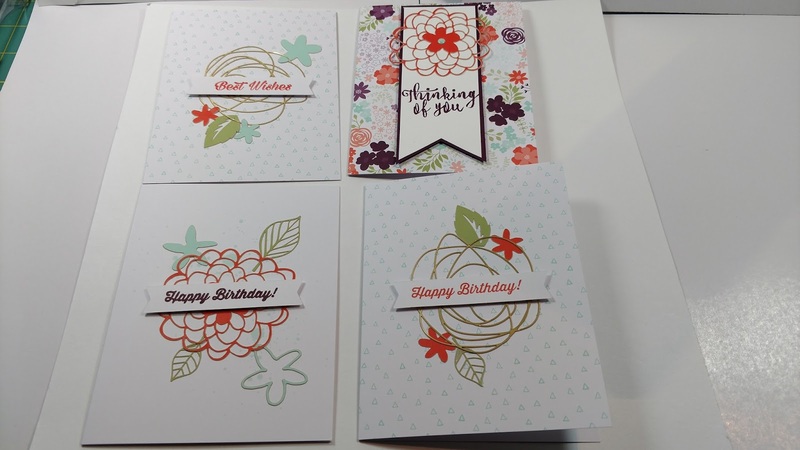 The inspiration to create these two cute birthday cards came from our team's sketch challenge. Every two weeks we're giving a new sketch to inspire and help us create. This inspiration comes from sketch number 5. 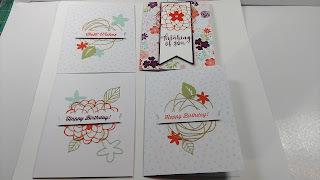 I chose to feature Stampin' Up's "Birthday Delivery" Stamp set. 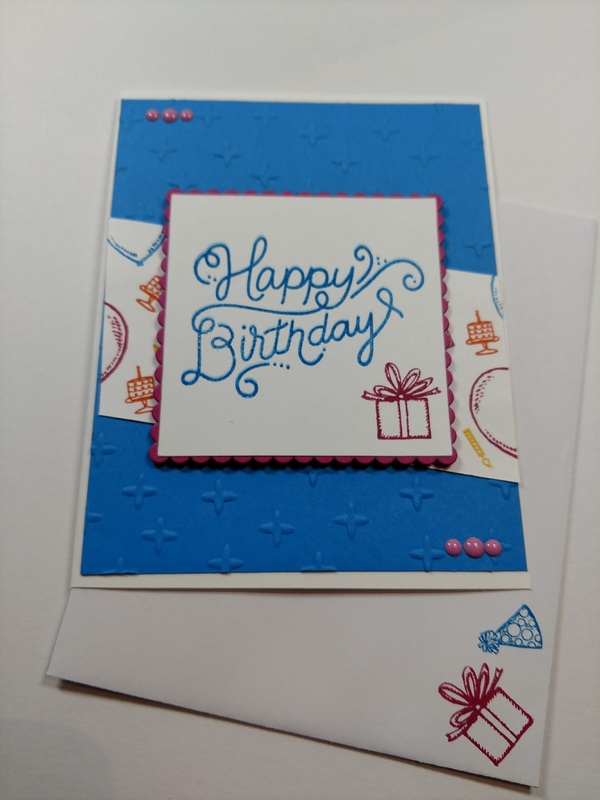 I really like how you're able to create custom designer paper with some of the stamps. 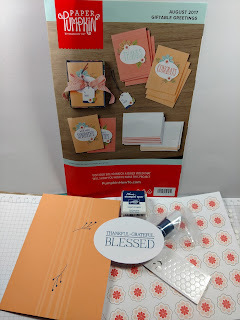 This stamp set comes in a bundle but for this project I only used the stamp set. Pacific Point Cardstock 4" x 6"
Sweet Sugarplum Cardstock 4" x 6"
Berry Burst Card Stock 4" x 6"
Lemon Lime Twist Cardstock 4" x 6"
Create custom designer series paper using the Birthday Delivery stamp set on one piece of whisper white cardstock. On the other piece stamp the sentiment. 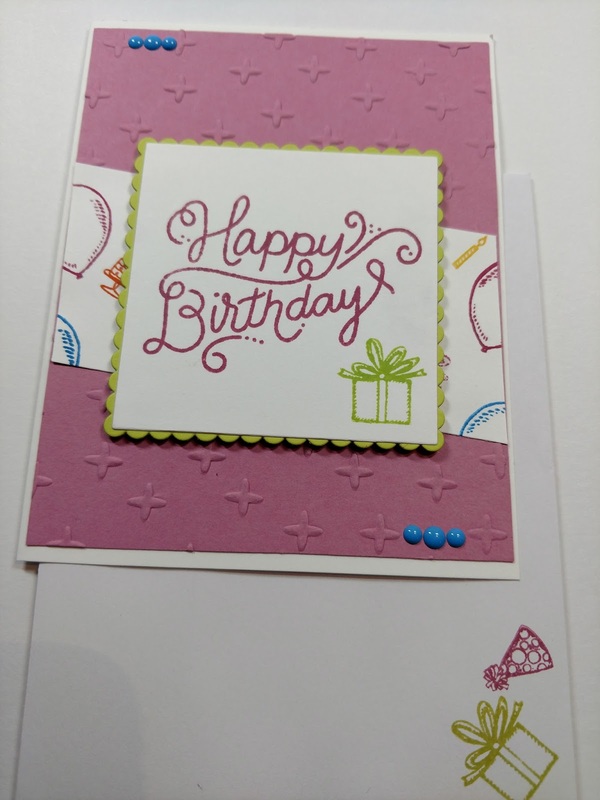 Using the 3" scalloped square die and cut the berry burst burst and lemon lime twist cardstock. Stamp sentiment on the other piece of whisper white cardstock and use the 2 7/8" square die to cut out. To give sentiment layer an extra pop stamp birthday present image. 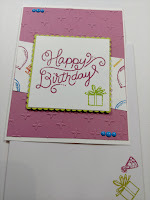 Use Sparkle embossing folder on the Pacific Point and Sweet Sugarplum cardstock. 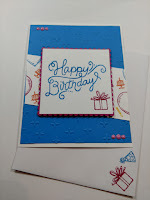 Use the fast fuse adhesive to attach the embossed cardstock to the card base. Use adhesive to layer designer series paper according to the picture. Use adhesive to attach sentiment square to scalloped die cut square. Using dimensionals to attach the sentiment layer to card base. Add six enamels shapes (3 on top & 3 on the bottom). This will give the card that extra bling! Woohoo another cute project completed. 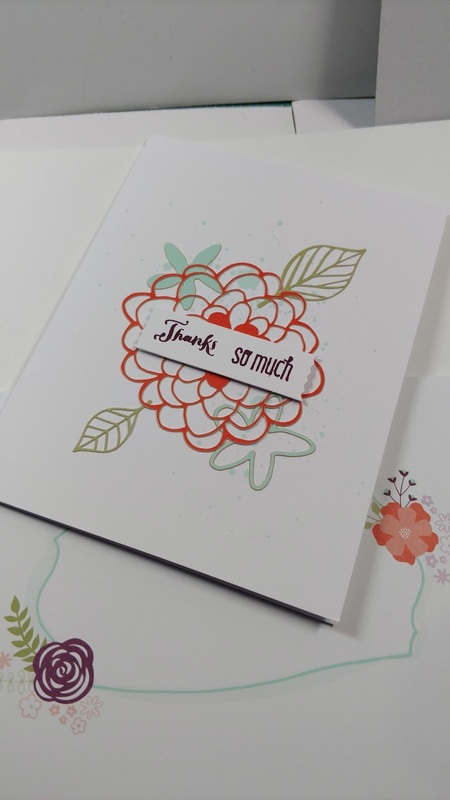 Wouldn't you love to give someone this handmade, heartfelt birthday card. 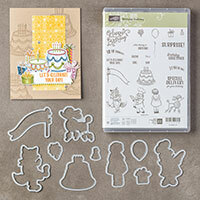 Join my team and let me share with you how to make this cute card! and see the holiday catalog video. Get creative using this holiday season idea book. 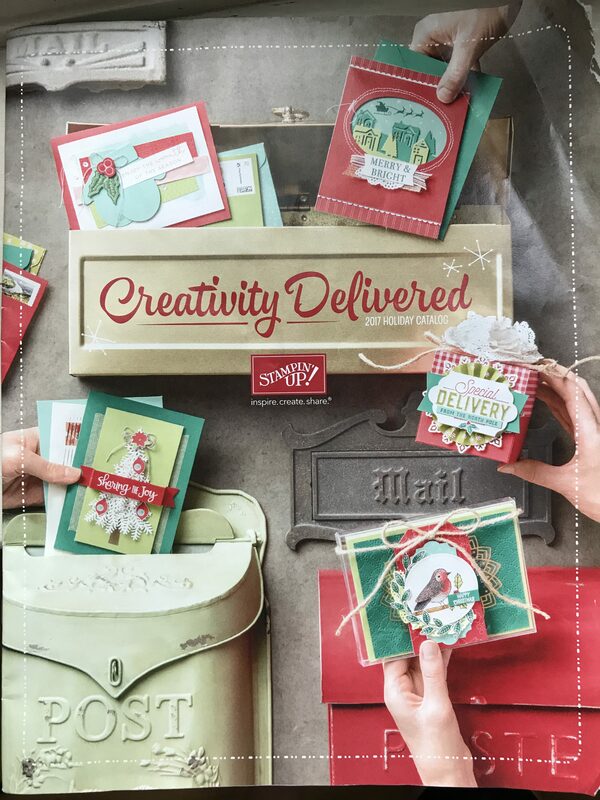 I hope you enjoy this wonderful holiday catalog and the endless crafting ideas. And if you need someone to give you project ideas, let me be your creative coach. Thank you reading my blog. 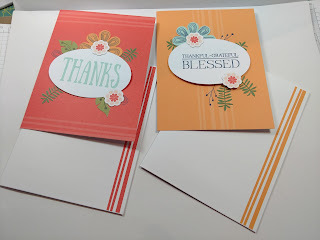 Paper Pumpkin August 2017 Giftable Greetings Images©Stampin' Up! Say hello to our Giftable Greetings kit, which was designed with gift-givers in mind. 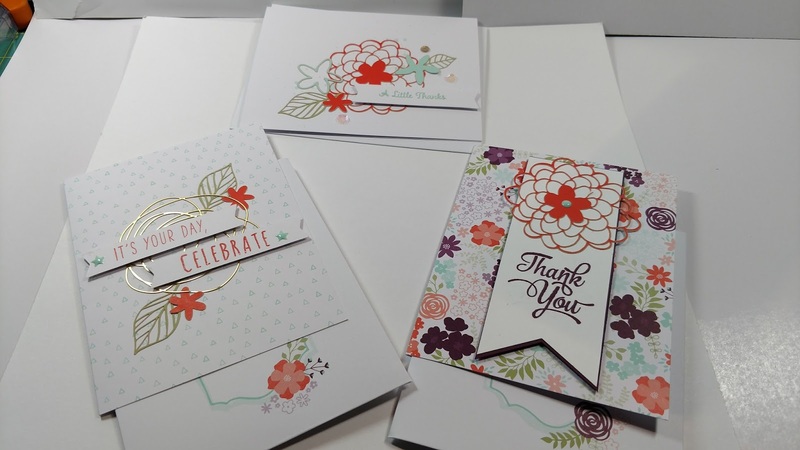 We have given you everything you need to make eight multi-occasion cards in summery sorbet colors, plus you get a delightful designed box with a clear acetate top to put them in. It’s so cute, chances are you’ll need two--one for you and one to give away! As with all of our kits, the possibilities for Giftable Greetings are truly endless. And that’s one of the things we love about Paper Pumpkin. Each month you get a box full of creative goodies that includes everything you need to make lots of wonderful projects—but you can also add whatever else you have in your own crafting supply to make something truly unique. There's still time to get the refills for this kit. Become a subscriber by September 10th and you will gain access to all past kits and refills while supplies last. The period for this particularly pleasing Paper Pumpkin promotion is passing posthaste! So promptly parade to, Paper Pumpkin and prepare to play with your precious parcel. Plus i'll be your pal if you participate. Paper Pumpkin is a monthly crafting kit that I get every month through the mail. 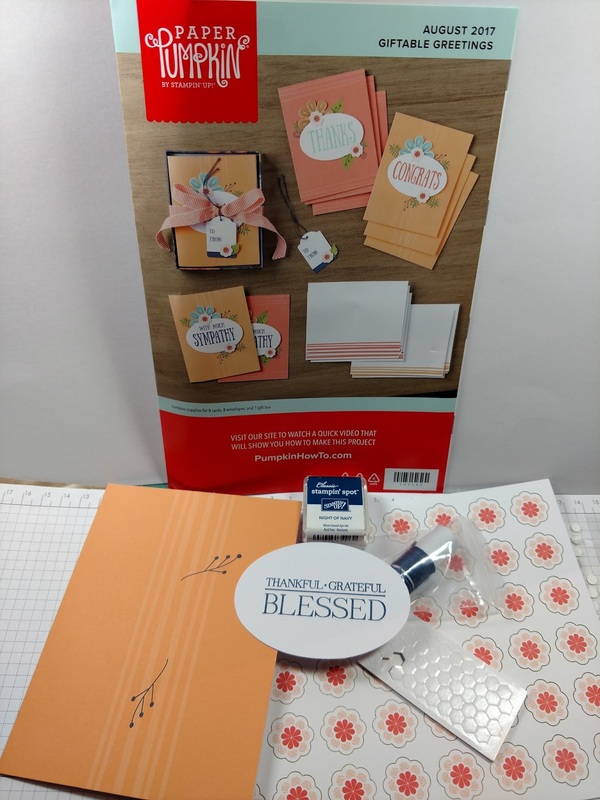 It’s done through Stampin’ Up!, a big quality crafting supply store which sells through demonstrators. I first learned about Paper Pumpkin when I became a demonstrator in December 2015. I have thoroughly enjoyed receiving this happy mail each month, because it always like Christmas or birthday each month. The creating possibilities are endless with your kits. One of the great perks of being a Paper Pumpkin subscriber is the ability to use your left supplies and stamp set on other projects. Since I've been a subscriber making alternative projects with leftover supplies and the stamp set is one of my greatest joys. 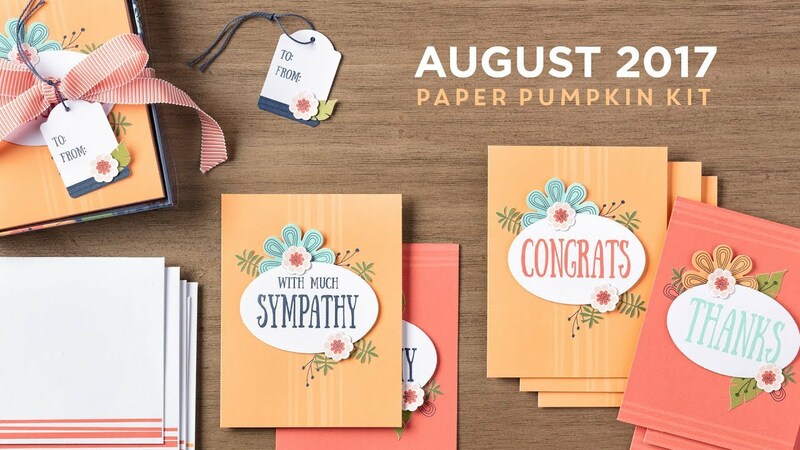 To make super cute alternatives from your Paper Pumpkin Kit subscribe by September 10 and get your first kit for 50% off the regular price. What a awesome deal. Thank you for visiting my page and happy crafting to you! Just signed up for Blog Lovin. Super excited to see how it works.